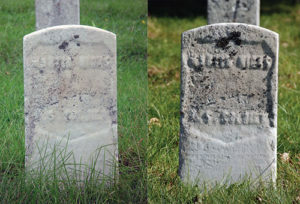 The tombstone of Martin Luther Nicks is a comparison as it usually looks (left) and how it looks when the sun light hits it at the correct angle (right). Martin Luther Nicks has been something of an enigma, an unknown. Even his marker, which was placed nearly 140 years ago, simply lists him as “U.S. Soldier.” There has been a consistent rumor that he was actually a veteran of the Confederate Army who had been mistakenly buried in the G.A.R. lot. While I’m not certain of the origin of this rumor, I wouldn’t be surprised if it was because he was from Tennessee, had lived in Minnesota less than a year before his death and that there were no known records of his service. With the few facts available, it seemed likely that Martin could have fought for the Confederacy. However, as more information has become available, it appears that Martin chose conscience over family and state. Martin was born in Hickman County, Tennessee in 1839, the eldest son of nine children. His father Perry Nicks, was born in Hickman County in 1816, and his Grandfather, Absalom Doak Nicks had served in the 1st Regiment Mounted Gunmen of the Tennessee Volunteers in the War of 1812, so the families roots in Tennessee were deep. As the reality of war approached, the pressure to choose sides must have weighed heavily on Martin, and like many accounts of brother vs. brother during the Civil War, Martin chose to go North, while his three younger brothers remained in the South and joined Tennessee units in the Confederate Army. At the outbreak of war, Martin enlisted in Company B, 1st Missouri Infantry for a period of three months. He saw action early on at the Battle of Boonville (a Union victory) and the Battle of Wilsons Creek (a Union loss), which was the first major battle fought in the Western Theater. Perhaps it was about this time, according to Nick family lore, that they received the only letter from Martin since he had left home. In the letter, he advised people not to go to war. His family never heard from him again and assumed that he had died in the war.